Definition at line 1008 of file CFG.h. Definition at line 1012 of file CFG.h. Definition at line 1032 of file CFG.h. Definition at line 1041 of file CFG.h. Definition at line 1036 of file CFG.h. Definition at line 1026 of file CFG.h. Definition at line 1025 of file CFG.h. Referenced by clang::AnalysisDeclContextManager::AnalysisDeclContextManager(), and clang::sema::AnalysisBasedWarnings::IssueWarnings(). Definition at line 1017 of file CFG.h. Referenced by clang::reachable_code::FindUnreachableCode(), clang::AnalysisDeclContext::getAddEHEdges(), and clang::sema::AnalysisBasedWarnings::IssueWarnings(). Definition at line 1019 of file CFG.h. Referenced by clang::AnalysisDeclContextManager::AnalysisDeclContextManager(), clang::ento::ExprEngine::bindReturnValue(), clang::AnalysisDeclContext::getAddImplicitDtors(), and clang::sema::AnalysisBasedWarnings::IssueWarnings(). Definition at line 1018 of file CFG.h. Referenced by clang::AnalysisDeclContextManager::AnalysisDeclContextManager(), clang::ento::ExprEngine::bindReturnValue(), clang::AnalysisDeclContext::getAddInitializers(), and clang::sema::AnalysisBasedWarnings::IssueWarnings(). Definition at line 1020 of file CFG.h. Definition at line 1021 of file CFG.h. Definition at line 1027 of file CFG.h. Definition at line 1023 of file CFG.h. Definition at line 1024 of file CFG.h. Definition at line 1022 of file CFG.h. Referenced by clang::AnalysisDeclContextManager::AnalysisDeclContextManager(), clang::sema::AnalysisBasedWarnings::IssueWarnings(), and clang::ento::ExprEngine::VisitCXXConstructExpr(). Definition at line 1014 of file CFG.h. Definition at line 1028 of file CFG.h. Definition at line 1015 of file CFG.h. Referenced by clang::AnalysisDeclContext::getCFG(), clang::AnalysisDeclContext::getUnoptimizedCFG(), and clang::sema::AnalysisBasedWarnings::IssueWarnings(). Definition at line 1016 of file CFG.h. 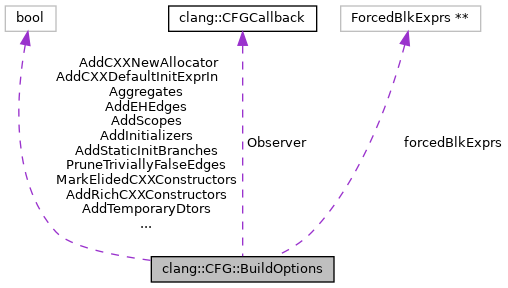 Referenced by clang::AnalysisDeclContextManager::AnalysisDeclContextManager(), clang::AnalysisDeclContext::getCFG(), clang::AnalysisDeclContext::getUnoptimizedCFG(), clang::AnalysisDeclContext::getUseUnoptimizedCFG(), clang::AnalysisDeclContextManager::getUseUnoptimizedCFG(), and clang::sema::AnalysisBasedWarnings::IssueWarnings().